"Where are we gonna go next Luigi?" The evolution of 3D Mario has been something that has been on a trend towards achieving a representation of a 2D side-scroller in a 3D setting. This has culminated in the 3D Land/World series of games. 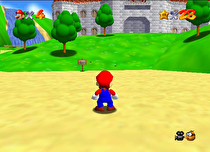 But what about the style of 3D Mario that Nintendo had started way back in 1996 with Super Mario 64?